Things 1 and 2 watch me play Kerbal Space Program occasionally and I’ve been trying to get them interested in space by showing them YouTube videos of real rocket launches and interviews with the astronauts on the space station. 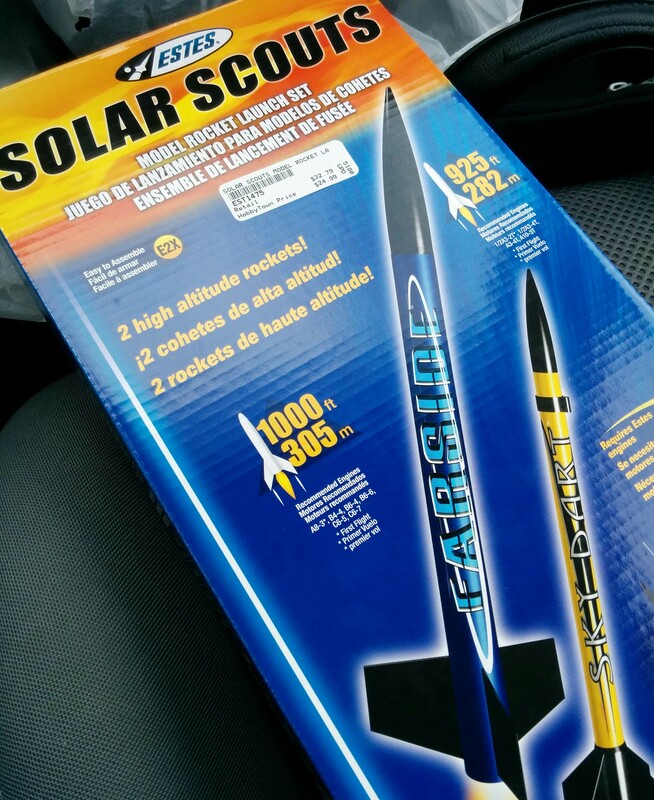 Somehow last week the topic of model rockets came up and it got me thinking about trying that out, because of course I need yet another hobby. I stopped by the local hobby store on my way home last Friday and picked up an Estes rocket kit, engines, and recovery wadding. 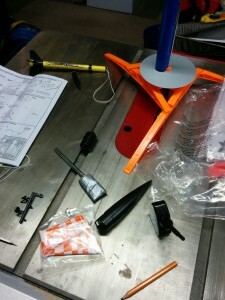 Model rocket kits come in various skill levels. The one I picked up was an E2X, which means easy to assemble, and basically just required gluing parts together. There’s two levels below that RTF for ready to fly and ARF for almost ready to fly which require no or very little assembly, and then there’s Skill Levels 1 up to 5. The E2X was about perfect for the level of effort I wanted to put into things. It required some basic assembly skills and model glue. 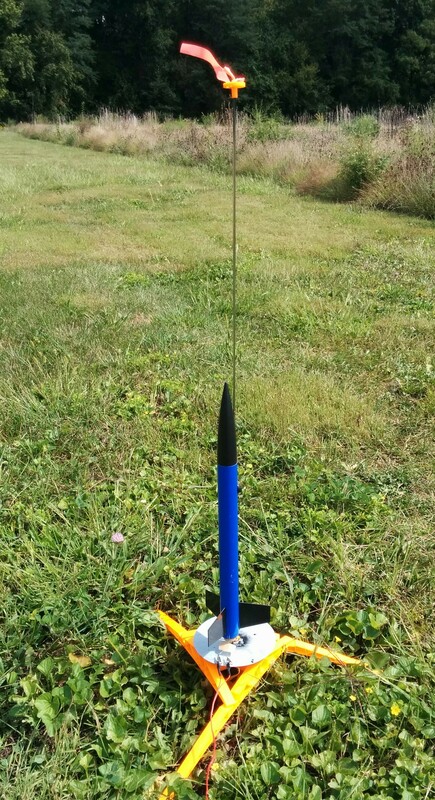 I was able to put both rockets and the launcher together in about an hour. On Saturday my dad and I took the boys to a nearby nature preserve (basically a field/trail left to grow wild) that was usually not busy and picked a corner to set up the launcher in that would put us upwind of an open field. 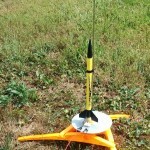 We started with the smaller of the two rockets, the Sky Dart, and had three great launches. Unfortunately the orange streamer come off on the first flight. 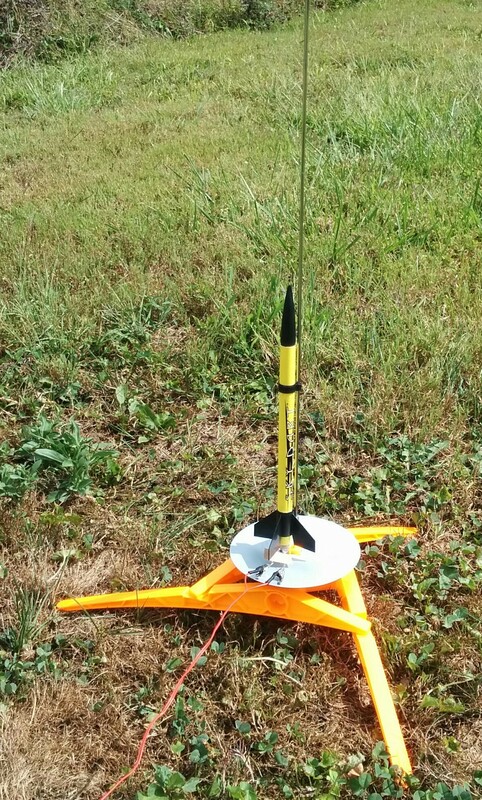 We were able to track it and recover it on the second launch and should have stopped there until I could get some orange tape or ribbon to replace the lost streamer. The third launch neither my dad nor I could track after it went up and we never were able to locate where the rocket came down. The weather started to sour on us about than anyway, so we packed up and headed home for a few hours. When things cleared up in the afternoon, I came back with just Things 1 and 2 to try out the remaining rocket from the kit, the Farside. It was quite a bit larger and had a parachute on it, so I figured it would be easier to track and recover. The first launch I forgot to take the little orange cap of the top of the launch rod. The rocket took care of that for me, but it only went up about 20 feet and it veer sharply to the right. So it turns out our position with respect to the wind was good for more than just keeping the rocket from landing in nearby trees, as it kept the misfire headed away from us rather than towards us. The boys of course thought it was hilarious. The second and third launches went great. The Farside didn’t get the same altitude as the Sky Dart and was far easier to track even without the parachute. I had some issues getting the parachute rolled up right. It deployed fine on the second launch but seemed too tangled on the third and final launch. There’s definitely some skill with that and getting the recovery wadding packed right inside the rocket. The wadding is important as it’s a non-flammable kind of tissue paper that is supposed to protect the chute and nose cone from the second charge that fires after the rocket launches. This charge is supposed to pop the nose cone off and push the parachute out so it deploys near the apogee of the flight path. The problem is if you put too much in, then the chute might not fully deploy. Put in too little and you can end up with a brown singe spot on your parachute. So there’s definitely some skill there that I need to practice. It was a lot of fun and unlike some of my hobbies, doesn’t require a lot of time at least at the level I’m currently at. 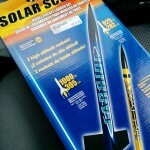 I’ve already ordered a small rocket to replace the lost Sky Dart and a bunch of new rocket engines. I’m looking forward to flying them again soon.